In March, we celebrate Women's History Month as bursts of bright color spring from blossoms across the campus. Just as these first flowers must be the most hardy to survive the blustery transition from winter into spring, the women represented around the U.S. Capitol are no shrinking violets. "Pick me up at nine and don't forget your boots." 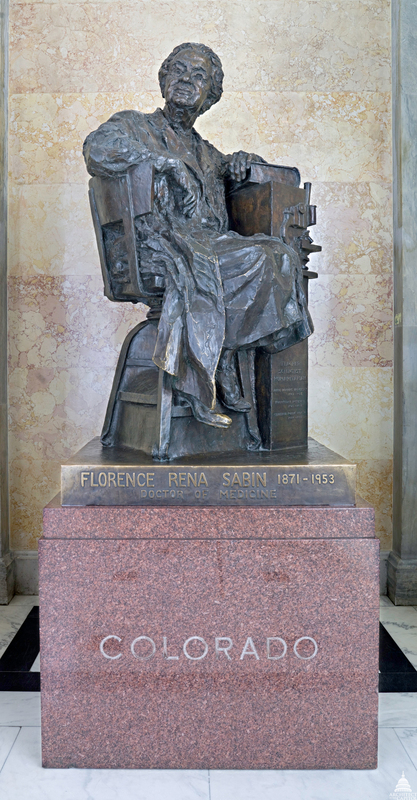 Statue of Florence Sabin in the U.S. Capitol. The statue of Sabin, in the Hall of Columns, reflects her spirit, with her head lifted, gaze focused and body poised to jump off her chair and into action. The woman who sculpted Sabin, Joy Flinsch Buba, would have understood her subject's drive. Buba traveled the world to learn her art and created many well-known works such as a sculpture of John D. Rockefeller at Rockefeller Plaza in New York City and a bust of Pope Paul VI at the Vatican Library. In all of them, Buba said, "The thing I am driving at from the very first is the quintessence of the person." In her likeness of Sabin, she certainly captured that. Buba also found the time to illustrate a number of children's books, and so she shares a literary connection with Anne Whitney, the sculptor and poet who carved the statue of Samuel Adams that stands in the Crypt. Whitney advocated for women's rights and the abolition of slavery, and her subjects often reflected her beliefs, including Adams, one of the few Founding Fathers who was not a slaveholder. She depicted him with arms defiantly crossed, steely gaze leveled. One can imagine him facing off against British loyalists in a debate or rallying American patriots to the cause of independence. Whitney likely understood her subject's fiery determination. The year before she was commissioned to depict Adams for the Statuary Hall collection, Whitney won a competition to sculpt Senator Sumner, only to be disqualified when the contest judges learned she was a woman. They considered it unbecoming for a woman to sculpt a man's legs. Statue of Samuel Adams in the U.S. Capitol. Rarely is marble so grandly human.